This Beetroot Hummus is the perfect dip for any party, get together or just as a quick snack. 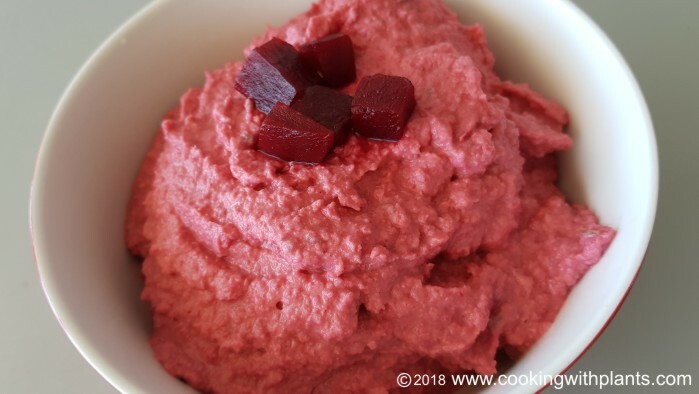 I have made this in celebration of valentine’s day because of the lovely pink and red look of this hummus… but regardless of what time of year or what color, this is truly one of the best tasting hummus recipes I have ever created! Place all ingredients in a food processor or powerful blender and blend until smooth and creamy. Serve with fresh cut vegetables (carrots, cucumbers, red bell peppers etc) or crackers of yur choice! YUM! The audio was weak with this video. What happened to your other kitchen, did you move? The other kitchen had better acoustics. My microphone had issues. It’s been a terrible week for technology. Next video will be much better again 🙂 Yes I have moved. I received your newsletter with this recipe this morning- here in Switzerland. I made this recipe immediately! Had it for breakfast on whole spelt toast! Yum! Thank you so much for this recipe! I’m excited to try it. Love how your kitchens are always so spotless and sparkling. It was difficult hearing you. I can’t wait to try this, I imagine the beet adds some sweetness to the hummus. Please convert your can sizes to pounds or ounces. 400 gram and 150 gram. Thank you. Are your cookbooks also in grams? I love beets, thanks for the recipe, I’ll have to try this! Anja, so happy to see you back developing your lovely recipes. This is definitely a keeper, thank you! Hi Anja, tahini has started making my throat itch, will substituting it with a nut butter (not peanut) work, if so, which do you suggest? I love that you are skipping the oil. It is a wake up call for me. The recipe for mayo is great also. These are 2 mistakes I always make using oil and mayo. My video/audio is perfect. What a beautiful Valentines dish. I made a test taste and it is delightfully good. 🙂 BTW, you look lovely in red. <3 Happy Valentines, Anja. The audio was ok on my side! Thanks so much for the recipe!!! Oh great 🙂 Thanks for letting me know. Glad you liked it!! Great recipe. Thanks for posting this. I had no tahini, so I added sesame oil. Really delicious, thanks. I boiled baby fresh beets as well.